I was attending the annual leadership summit for a client of mine. In the morning I gave a speech, and in the afternoon, the CEO presented his “state of the firm” address to his top 150 executives. At the end of his presentation, The CEO, Roger, asked if there were any questions. Several hands went up. One executive asked, “Roger, can you go back to slide 15 and say more about the decision to move to shared services?” Another asked the CEO, “Why did we take so many financial reserves last year? Can you go back to slide 21?” Roger, who was very tall—about 6’8”—began to slouch and frown. The backward-looking, nitpicking questions went on for another 15 minutes. Roger kept checking the clock on the wall. I could see his frustration steadily rise. I raised my hand. I didn’t know Roger very well—we’d met only a few times. But I wanted to build a relationship with him. Roger looked up. He smiled, and took a deep breath. “Well,” he began. “Well, there is something.” He described an initiative that was not prominently featured in the formal plan. It was clearly a program he cared a lot for. He was now upbeat. He went on for five minutes about it, smiling the whole time. As we left the auditorium, I walked with the crowd towards the door to the street. Suddenly I felt a large hand slap my back. Really—like a baseball mitt, whacking my shoulder. I turned around, ready to confront the perpetrator. It was Roger. He was striding by me, heading out to jump in a car. “Call me,” were his final words as he hurried away. And I did call him. And that was the beginning of an ongoing relationship with him and his company. The catalyst was a simple question that’s little yet big. In an instant, it created three powerful shifts. First, it shifted the conversation from a re-examination of the past to one of the future. Second, it took us from the details to the big picture. And third, it moved us from analytical to the emotional. It’s not that the past, the details, or the analytical are bad. Not at all. But right at that moment, the best question was the one I asked, which truly engaged Roger and drew him out. It transformed the conversation. That day, I wasn’t particularly smart or clever. I didn’t try and show off my expertise. I just asked a question. 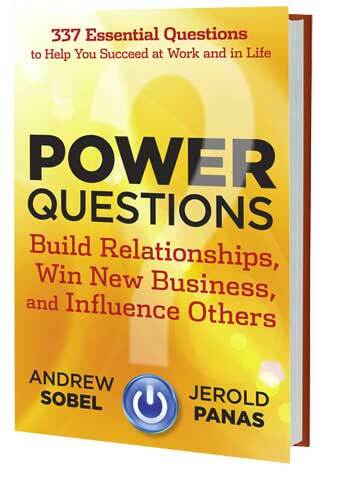 The Power Questions App is now available!